When most people think about a severe thunderstorm, they think about threats such as heavy rainfall, lightning, wind, and sometimes tornadoes. However hail is a common occurrence in thunderstorms, and can be not only widespread, but also damaging. The Insurance Information Institute has recently said Hail Damage is averaging $10 billion per year. Needless to say, it’s become one hail of a problem. (pause for everyone to groan…get ready, there’s one more pun somewhere in this post). Graphic of hail formation. Source: Weather Imagery. One of the key components for thunderstorm formation is the presence of an updraft. In other words, an updraft is the presence of strong winds moving up in the thunderstorm. Temperatures inside a cloud are much colder than those at the surface, and usually all precipitation begins to fall as ice crystals. Typically, as the crystals fall towards the ground, they begin to melt, and become rainfall (unless it’s winter, then it could be cold enough to stay as snow). However, in the presence of an updraft, these particles stay up in the cloud much longer, continuing to accumulate and grow the ice crystal into bigger chunks of ice. As soon as they are heavy enough to overtake the updraft, they begin to fall as hail. While melting can still occur on the way to the ground, they still tend to be very large when they reach the surface. Hail Classifications provided by the National Weather Service. Depending on the strength of the thunderstorm, they can range from very small and a nuisance to very large and destructive. The hail can be so small, it can seem like it’s snowing. 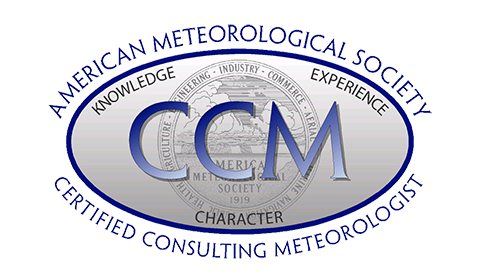 The National Weather Service has classified hail into numerous categories, from as small as one quarter inch diameter (pea size) to as large as 4 and a half inches (softball size). Although they can be bigger than 4.5”. The largest hailstone ever recorded occurred in Vivian, South Dakota, when a 8.0” hailstone fell on July 23rd, 2010. It was weighed in at a whopping 1.93 pounds! Where Does Hail Form in the United States? The Storm Prediction Center keeps tabs on hail reports across the United States. In their database, there have been nearly 350,000 hail reports between 1955 and 2017. Location of all hail reported in the United States, between 1955 and 2017. Source: Storm Prediction Center. 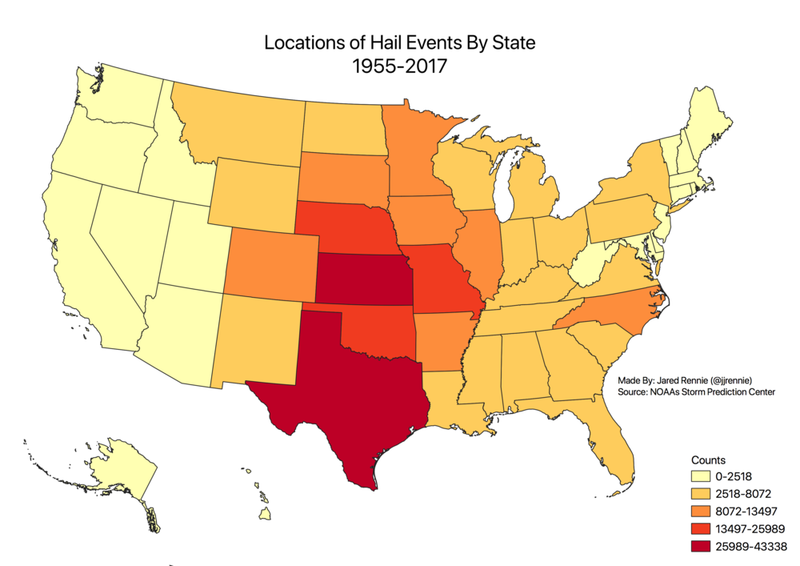 This graphic basically confirms hail occurs in every state and territory, including Alaska (23), Hawaii (17) and Puerto Rico (26). Using a little bit of GIS technology, we can clean up this map some. Location of hail reported in the United States, by state, between 1955 and 2017. Source: Storm Prediction Center. The states in the far west and north east have the fewest amount of hail. While part of this might be due to the size of the state, or the lack or reports for an area, much still has to do with the dynamics of thunderstorms. These areas don’t have enough moisture as the central and southeastern parts of the U.S., due to the proximity of the Gulf of Mexico. As a result, the three lowest hail reporting states in the lower 48 are Nevada (279), Rhode Island (116), and Delaware (108). Nonetheless, hail can occur in every state and territory. But what about severe hail? Out of all the reports between 1955 and 2017, about 32% (109,000) are greater than 1” and less than 1% (2,100) are greater than 3 inches. Below is a graphic showing the spatial extent of 3 inch reports. The southern great plains (Nebraska, Kansas, Oklahoma, Texas) hail the winners (congrats, you found the other pun! ), with Texas having the most reports at 543. I guess everything really is bigger in Texas. Location of hail greater than 3 inches reported in the United States, by state, between 1955 and 2017. Source: Storm Prediction Center. Does it Occur Each Month? We can further refine this map, striping out the values that reported every month in the calendar year. An animation is below. Most hail events occur in the spring or summer time. Although it can happen in every month of the year. Large values (greater than 4,000) begin in Texas in March, and then slowly move northward as the spring months turn into Summer. By the end of the year, only parts of the south (including Hawaii) experience hail events. Location of hail reported in the United States, by state and by month, between 1955 and 2017. Source: Storm Prediction Center. Does it Hurt If it Falls On My Head? Would you want softball size hail falling on you? I sure wouldn’t. This is why the National Weather Service urges everyone to remember the following phrase: “When Thunder Roars, go Indoors!“ While used for lightning safety, I would argue it can also be used for hail. While property damage can be problematic from hail, staying inside will shield you from injury-inducing ice chunks falling from the sky.